my Kershaw junk yard dog 2 has done the job well for about 12 years…but this might be my next knife. No weird fantasy knife,”tactical ” nonsense…just a straight forward knife that looks like it would be a good choice for EDC and would probably be there in the long run. Patrick, Thanks for checking out the review. I agree, Maxpedition has a real simple design here. Could be a great choice for a practical utility knife. Mr. Looney’s comment is spot on. 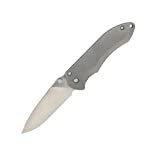 I require that my edc knife be at least 3.5 inches such as the Spyderco Endura or Police model or the discontinued Kershaw 1840. When I have been out of the country, I have wanted something even more substantial such as the Buck 110 even though it does deploy very quickly. The larger knife seems to fit that bill.